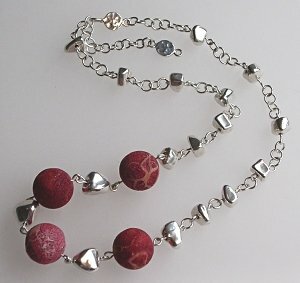 This necklace feaures four coral beads suspended between Sterling Silver hollow nuggets on a handmade silver chain. Each coral bead is individual in colour and markings. The necklace is finished with a hammered silver toggle clasp which compliments the chain and nuggets.